Colon & Rectal Surgery Associates, Ltd.
Minnesota Endoscopy Center is an outpatient surgery center conveniently located between Minneapolis and Saint Paul, MN. Physicians from three highly-respected organizations work in concert with the dedicated staff, to provide high quality endoscopy services and compassionate patient care. The Center features state-of-the-art equipment and provides easy access with added patient appointments, a convenient Twin Cities location, public transit options and free parking. 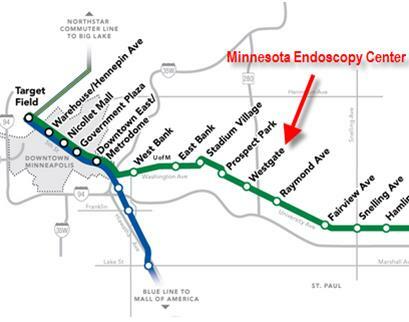 Minnesota Endoscopy Center is pleased to offer free parking for its patients and visitors. For your convenience, there is ample parking available in the lot directly in front of the building and adjacent to the entrance doors.